And so two years later, I deliver. Earlier this week I finally checked out Steve McQueen's 12 Years A Slave (2013). 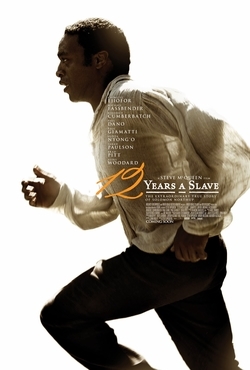 The movie is based on Solomon Northup's 1853 slave narrative memoir and was awarded the Golden Globe Award for Best Motion Picture - Drama and the British Academy Award of Film and Television Arts recognized it with the Best Film and the Best Actor award for Chiwetel Ejiofor's performance. It's 1841. Solomon Northup is a free African-American man working as a violinist, living with his wife and two children in New York. Offred short-term employment as a musician, he travels to Washington, D.C. with two white men, who drug and deliver Solomon to a slave pen. He is later shipped to New Orleans along with others who have been detained against their will. A slave trader named Freeman gives Northup the identity of "Platt", a runaway slave from Georgia, and sells him to plantation owner William Ford. 12 Years A Slave is a powerful piece of cinema. The movie's simple, horrible and true story is expertly crafted by McQueen and makes a deep and lasting impression. Anchored by Chiwetel Ejiofor's performance of contained fortidue, 12 Years A Slave depics almost unrelenting institutional brutality. A truly impressive piece of filmmaking.